The signing was absolutely wonderful!! Marie showed up almost an hour late and she was only supposed to stay an hour, but stayed about two and a half. She was laughing and happy and seemed to have a great time. She had Lisa Hatch, Karen Seamons and Sonja Bryer with her and they all signed for everyone. So I now have my book that came with Remember Me signed by all of them plus Marie's manager, Karl. My daughter's Disney tiny tots are signed by all three and my Mary Sunshine is signed by Marie and Karen. Her certificate was signed by Beverly Stoehr last year. How cool is all that!!! It was a casual relaxed atmosphere and I thought they did a great job with it. They gave all the MDF members the Remember Pin and Pin book set and Marie showed us the mock-up of the October issue of Dolls magazine with Remember Me's photo on the cover. The reunion was fun and Karen Seamons had asked if she and Sonja could come and do a Q&A with us. That was really great and Karen is a wonderful speaker. Sonja seemed somewhat shy speaking to the crowd, but very nice. One interesting fact, she was asked how long it takes to sculpt a face and she said it could take about two to three months unless they were using a face they had and making some changes to it. That explains why some of them look so much alike :) They had some games to play at the reunion like writing down Olive May Christmas and then making as many four or more letter words as you could. Carole, my daughter, won that one as she plays that all the time at after-school. She got "I Love You Beary Much Tiny Tot" signed by Marie and Karen. 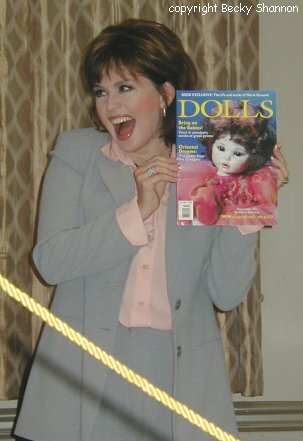 They drew a few names for the last dolls and I won "Debbie Tiny Tot" signed by Marie. Two of my friends won "Mato" and "Christmas Belle" Tiny Tots. They gave away quite a few dolls. They pulled off an amazing day and it was really wonderful.